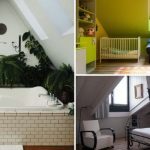 Opposites attract, so there has always been something fascinating about mixing old with new in interior design. 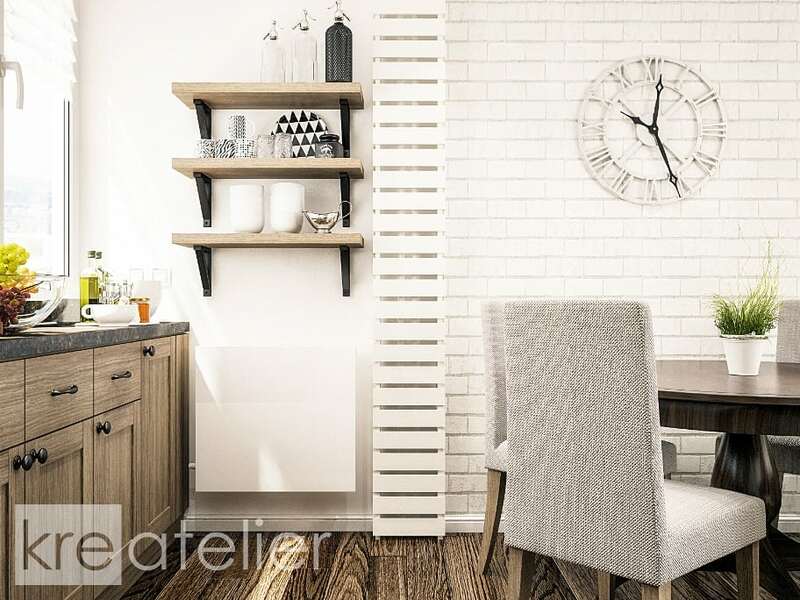 Modern lines and traditional details can be beautifully combined and used to create unique living environments. 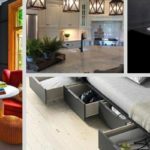 This post exhibits interior ideas that mix and match various design styles. 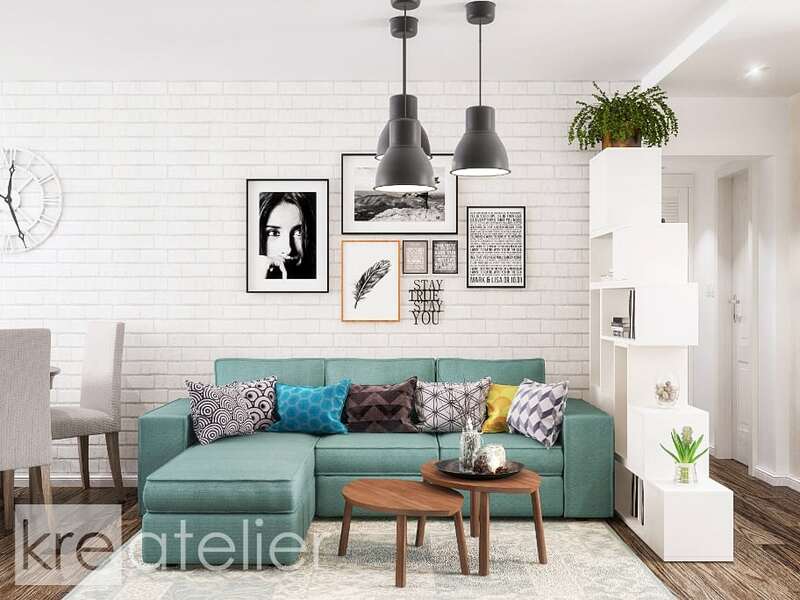 All projects are developed by KREATELIER – an emerging interior design studio from Bulgaria that specializes in home design for clients from all around the world. This is a remodel project of an interior space that accommodates a living room with kitchen and dining areas. The living room area is furnished with a turquoise sofa and decorated with bright-colored throw pillows. The L-shaped kitchen corner features walnut lower base units and all white upper cabinets with shaker doors. The countertop is set in black granite and the backsplash is finished with subway tiles. Stainless steel appliances are also a part of the design. The dining table fits between the kitchen and the living room area. It is furnished with a dark wood round table and a set of upholstered dining chairs in light grey. A brick clad feature wall adds texture and depth to the design. The hallway is also a part of the main living space. It is, however, separated from it by a stepped bookcase with cabinets and open shelves – the perfect place to display books and various collectibles. The foyer is tight but that is not much of an issue, as it opens up to the main living space. It is finished in off-whites so it looks bright and welcoming. 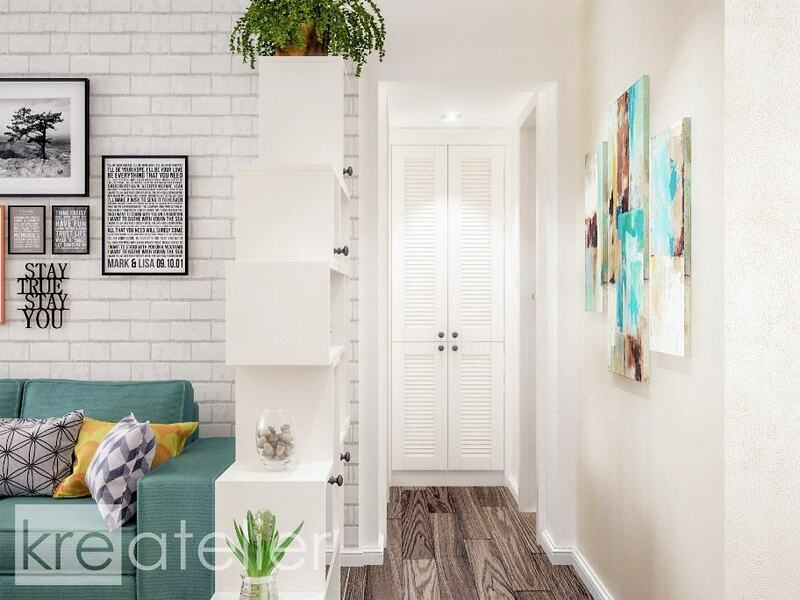 It is furnished with a shoe cabinet and a coat rack on the opposing wall. 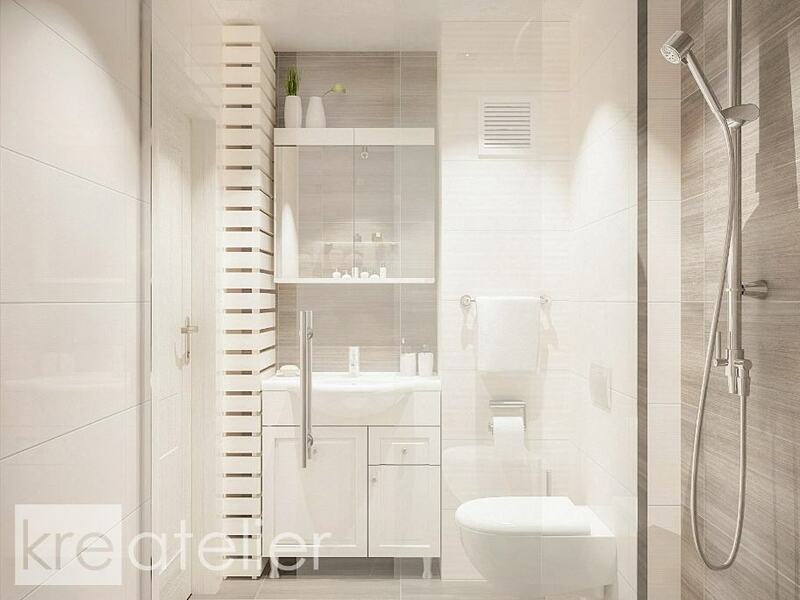 The bathroom may be tiny but it has a lot to offer in terms of conveniences and style. 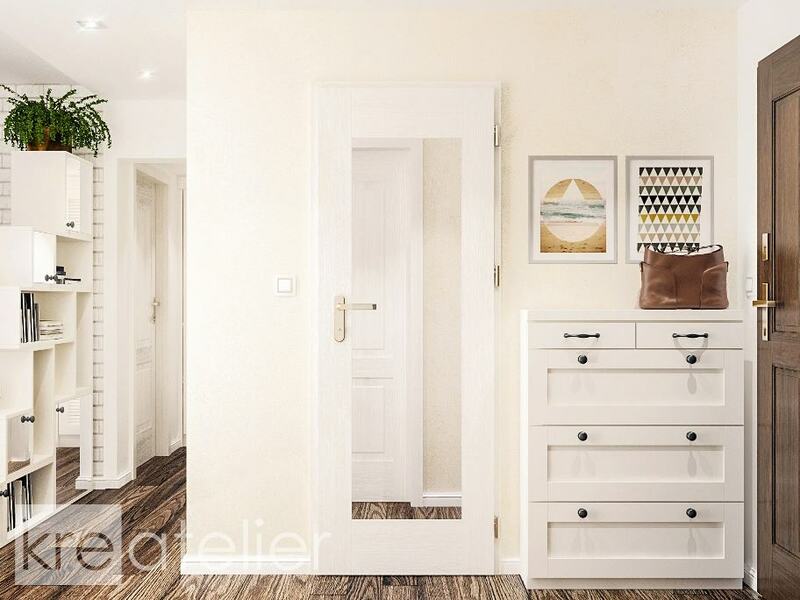 It is finished in white and light brown tiles that make it more open and inviting. The bathroom accommodates a shower area with a glass screen, a wall-hung toilet with a built-in tank, and a vanity counter with sink and mirrors. 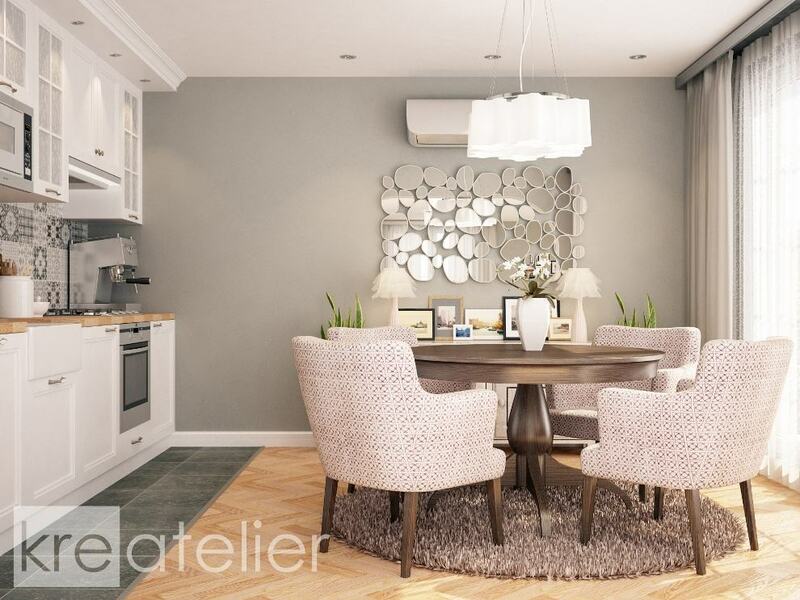 This modern-classic design of a dining room with a kitchen area is cozy and sophisticated. The dining area accommodates a round table with four upholstered chairs. It is overhung by an elegant chandelier and decorated with a designer mirror. 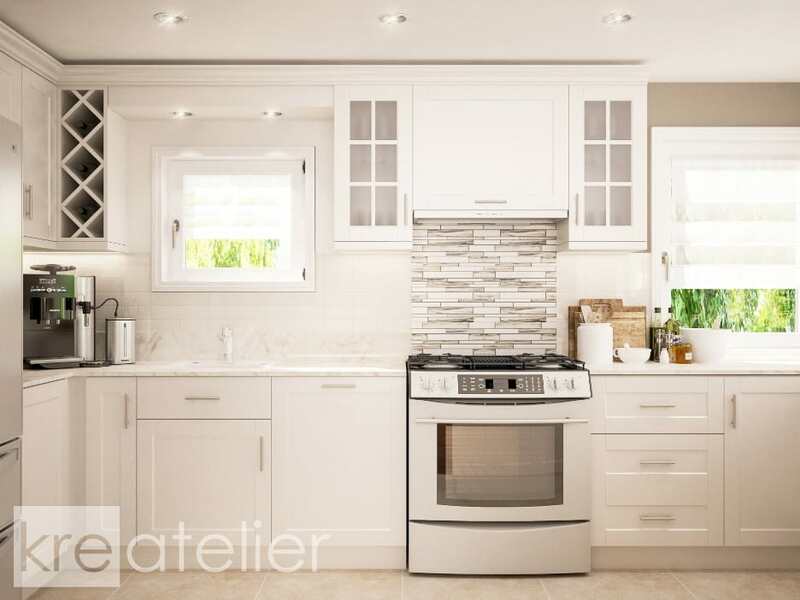 The kitchen area is set in white and finished with a wood countertop and a tiled backsplash. 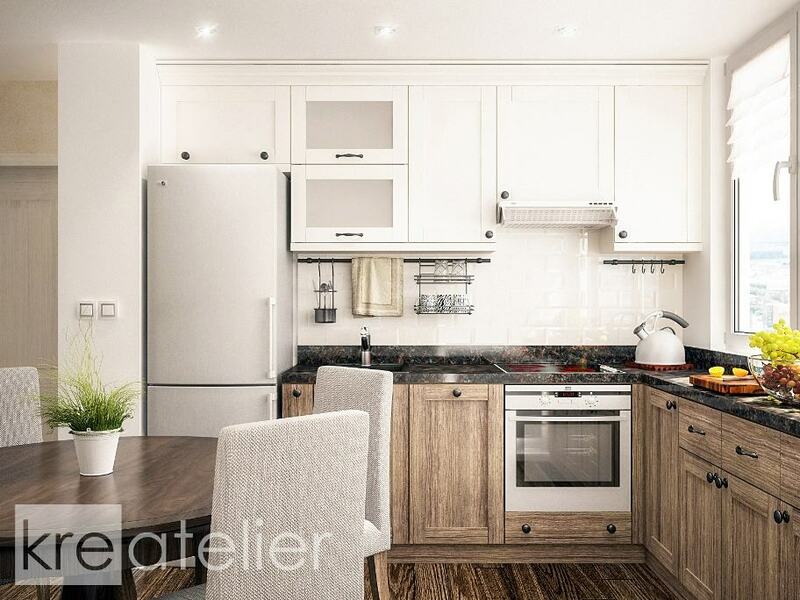 It is equipped with a porcelain sink, a french-door fridge and built-in appliances. A wine rack is also designed to fit between the upper cabinets. 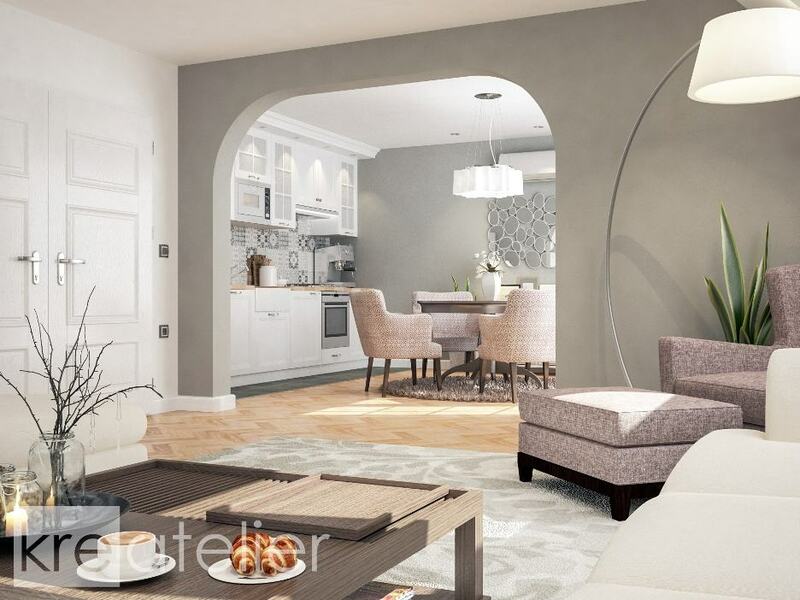 A large opening connects the kitchen and dining areas to the living room that is furnished with a white sofa, a coffee table and a TV unit. A reading corner is also designed beside the sitting area. The reading area is furnished with a comfortable armchair and a footstool that fit under a vaulted ceiling with skylight windows. 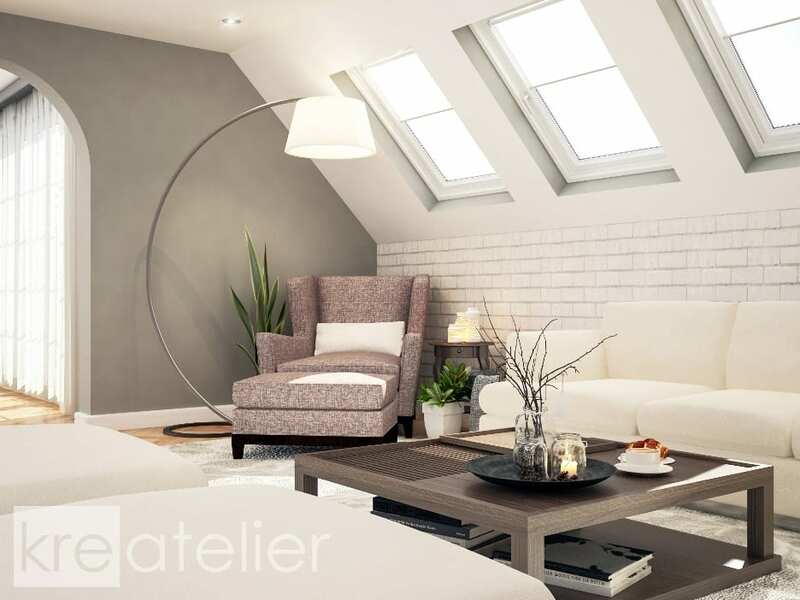 An arched floor lamp puts the finishing touch to the design and provides additional lighting. The home office is the best place to work in peace and quiet. It is furnished with a large fitted bookcase and a computer desk. A two-seat sofa is also available on the other side of the room. 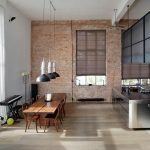 Large windows are sure to let in plenty of sunlight. A round chandelier and recessed lights, on the other hand, can be used to illuminate the room at night. A floor lamp is also available in the corner. 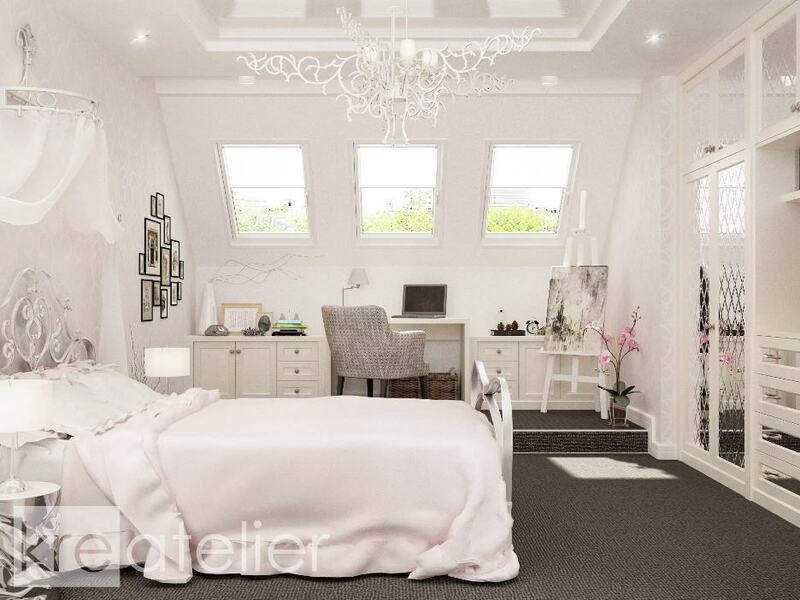 The master bedroom is packed with style and elegance. It is set in a perfectly balanced color palette in neutral grey and off-whites. The floor is laid with grey carpeting and the walls are finished in patterned wallpapers. The middle part of the room is occupied by a queen-sized bed with a draped window behind it and a seating bench in the front. The bed is overhung by a marvelous cocoon chandelier. A cozy reading area can be found at the far end of the room. It accommodates a fitted book cabinet and a pair of comfy armchairs under a sloped roof with skylights in it. 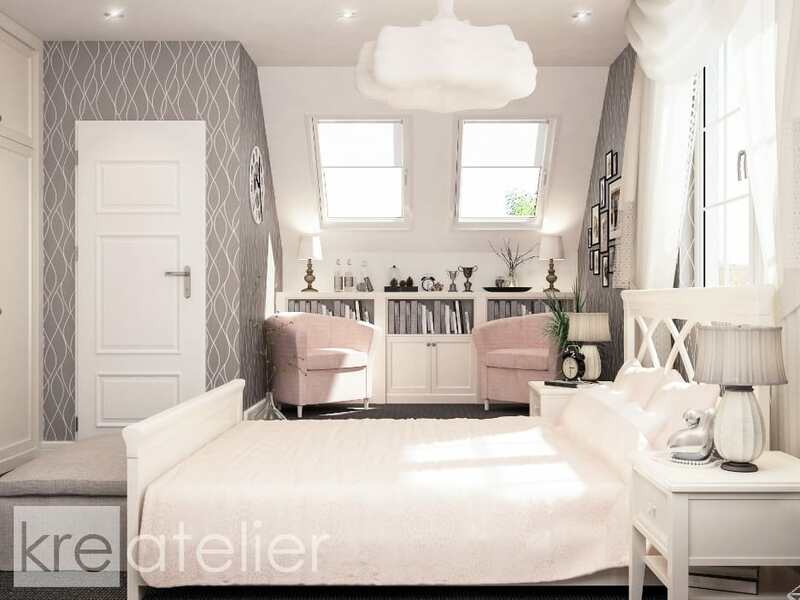 This princess-worthy bedroom design would be a dream come true for any girl. 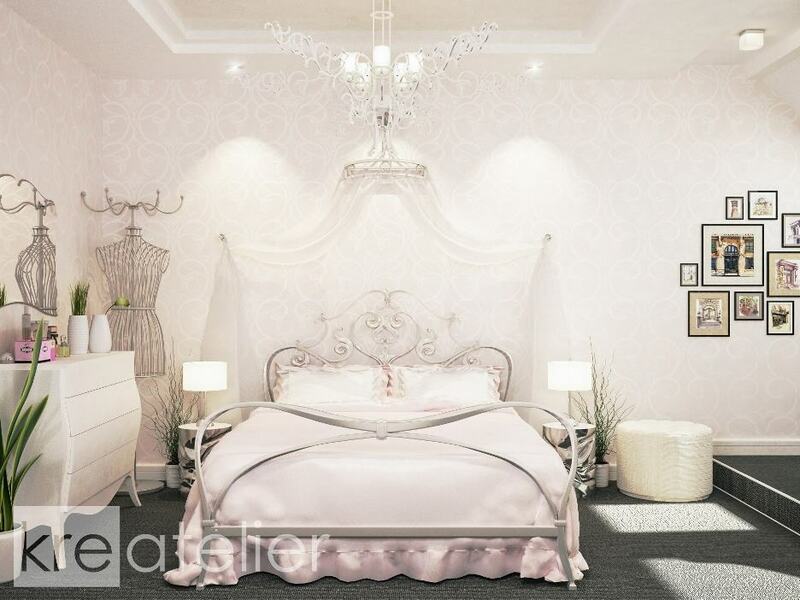 Elegance, luxury and comfort are the key ingredients in this exquisite interior in white, grey and pink. 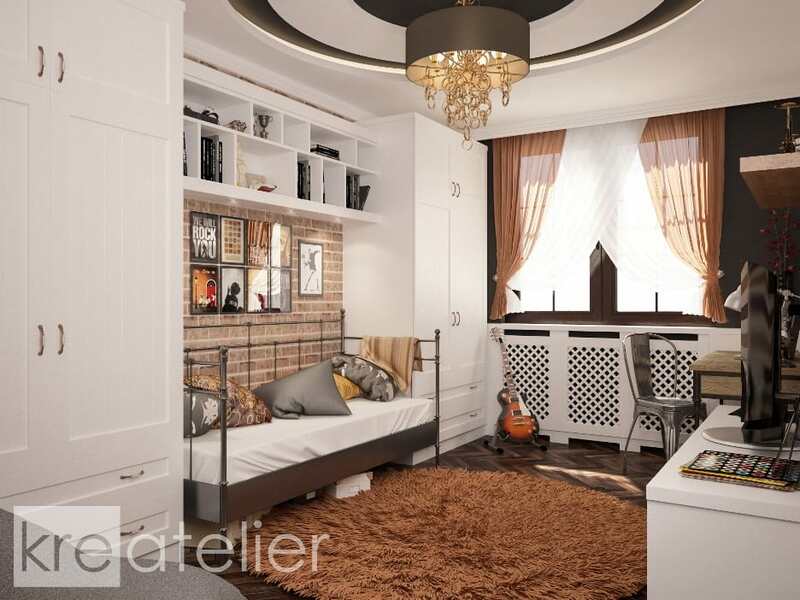 Furnishings include a wrought iron canopy bed with a set of bedside tables, a fitted wardrobe with diamond-patterned mirror doors, and a study area with a desk and cabinets by the windows. 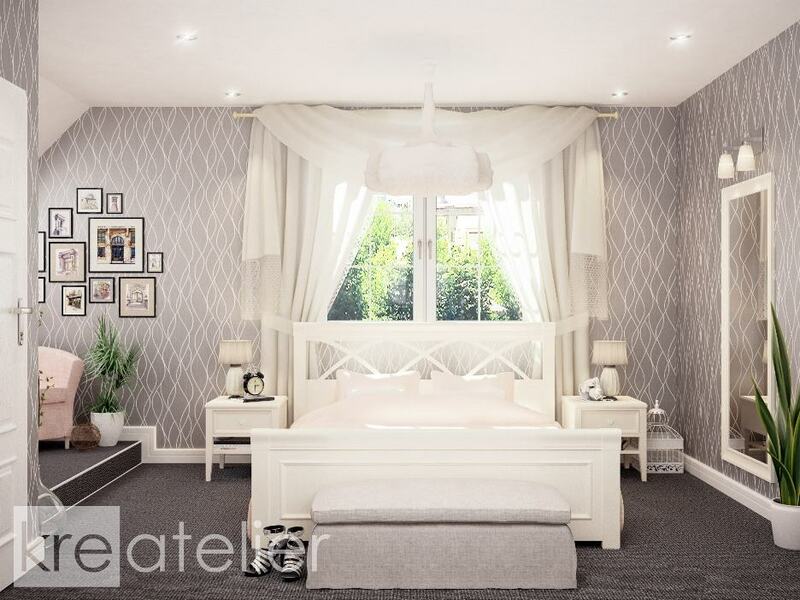 A fascinating chandelier hangs over the bed and makes a fabulous addition to the design.. Ornate details and a fine selection of accessories enhance the design by giving it character and a classic-modern vibe. This kitchen design was created for an American client who was in need of a major kitchen remodel. 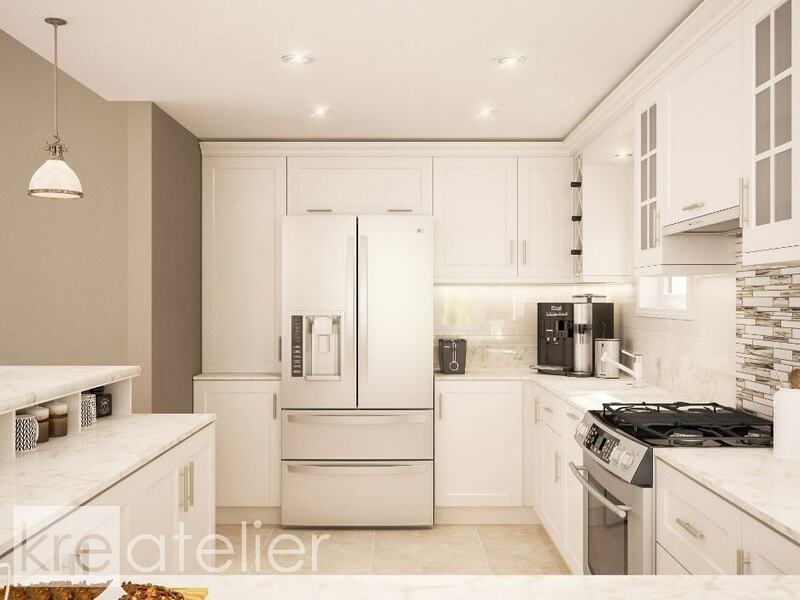 The project proposal includes an improved layout scheme with all new kitchen cabinetry and equipment. 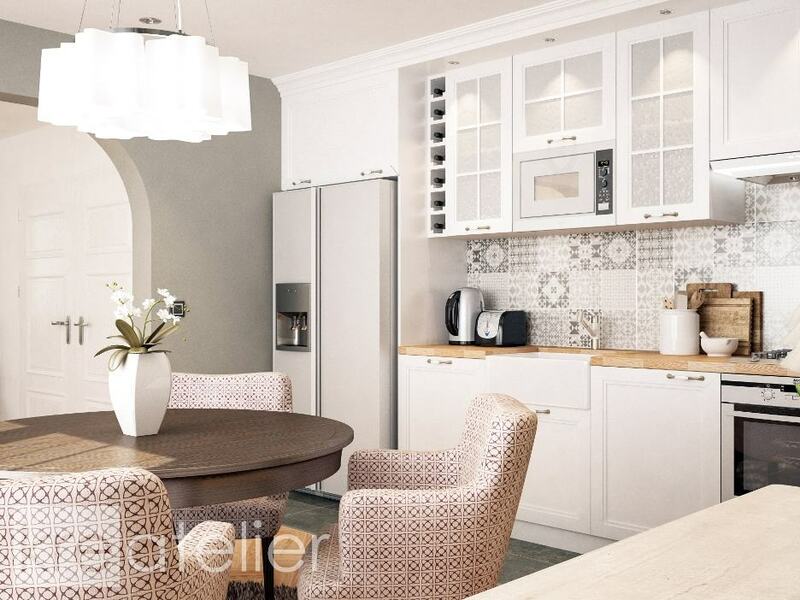 Furnishings include a whole lot of kitchen cabinets with plenty of storage space and worktop area. A breakfast bar counter is also designed to divide the kitchen from the more formal dining area on the other side of the room. 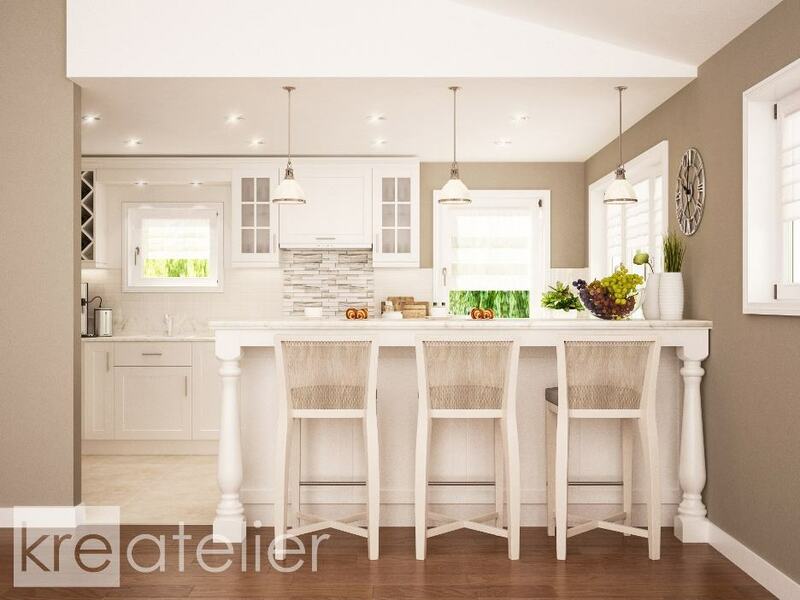 The kitchen cabinets are set in white and finished with shaker-style doors. The countertop is in granite, and the backsplash is tiled. Accent mosaic is also added right behind the cooking range. 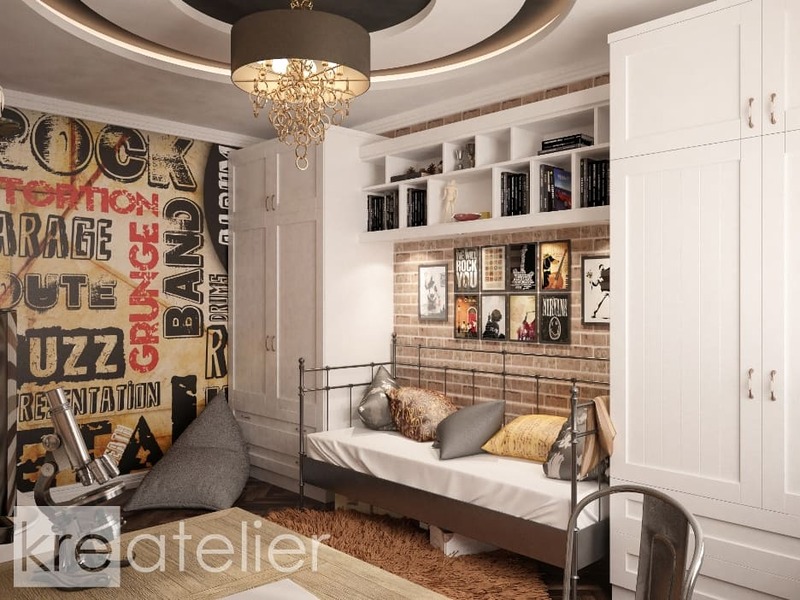 This concept design idea is developed for a teenage boy with a flair for rock music. It is an eclectic design that combines traditional elements with modern details. The design is set in white, black and rusty brown. The room is furnished with cottage-style wardrobes and cabinets, a wrought-iron bed and a desk. A fancy chandelier in black and gold puts the finishing touch to the design as it illuminates the room. 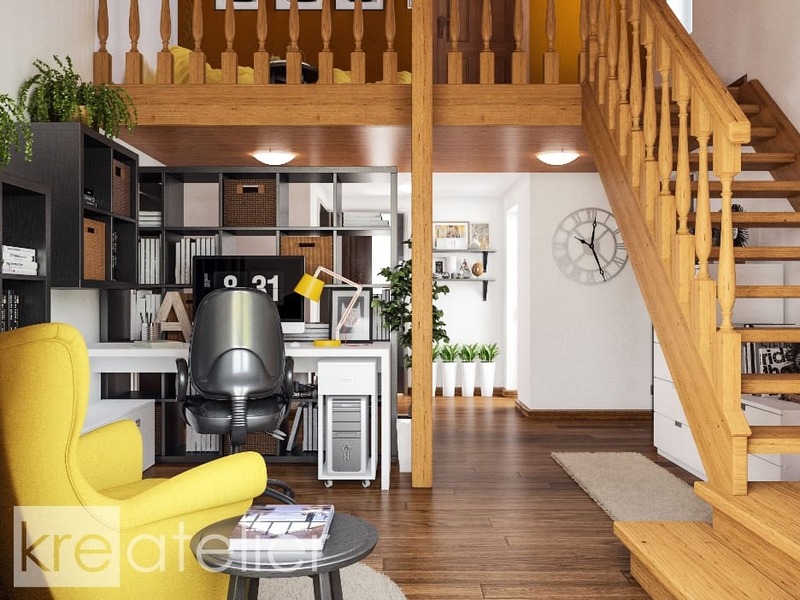 This home office accommodates a main study area with a cozy nook for relaxation on an upper level. The study area is nice and cozy. It fits behind a tall bookcase that separates it from the rest of the space. 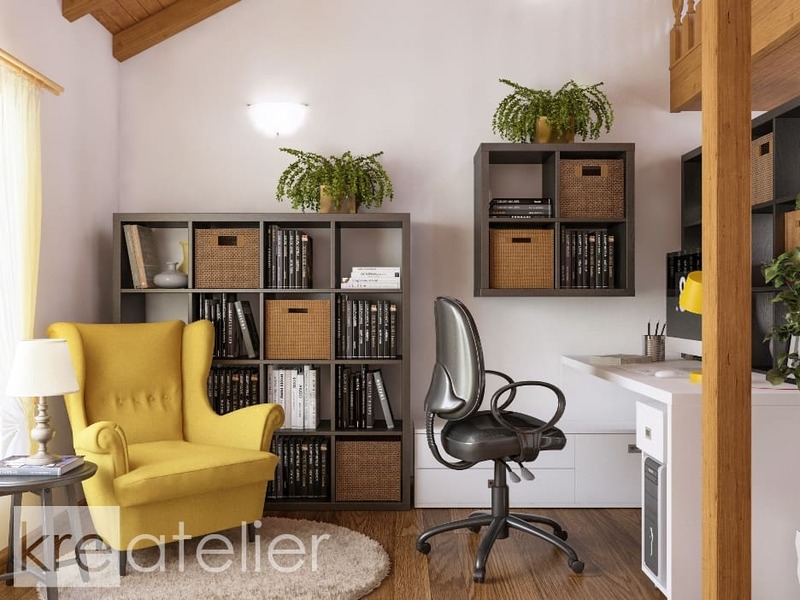 The study area is furnished with a set of bookcases, cabinets and a large L-shaped desk with an office chair. A reading nook is designed by the window – it is finished with a yellow accent chair, a round table and a shaggy rug. The master bedroom may be small, but it is packed with style and is bursting with color. 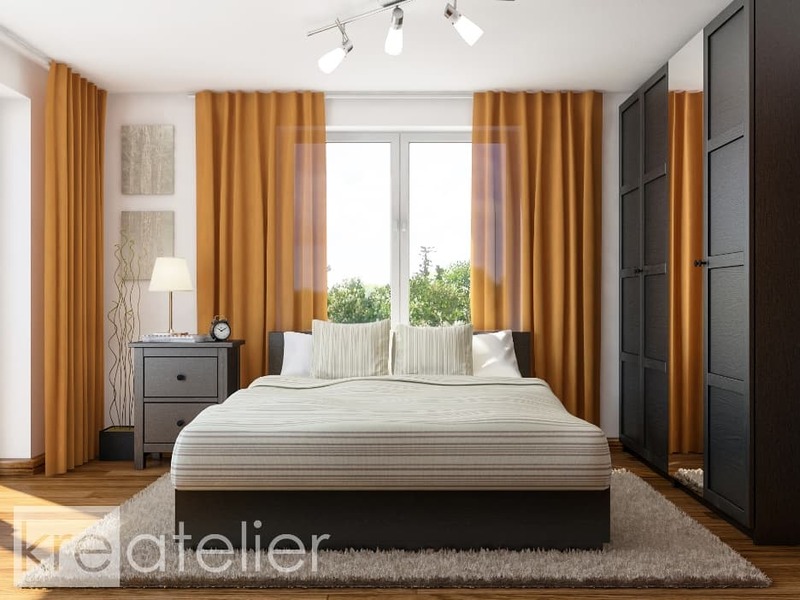 It is set in white and brown, with bright accents in orange. It is furnished with a storage bed with a side table and a large wardrobe. 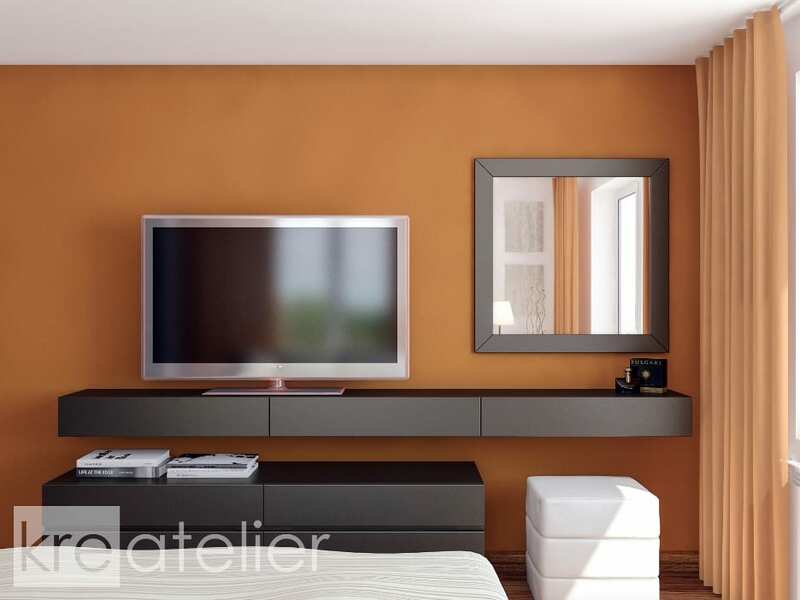 The bedroom also features a TV unit with a dressing table and a drawer chest along a feature wall that’s painted orange. All drawers are handleless which gives a nice sleek look to the whole design. 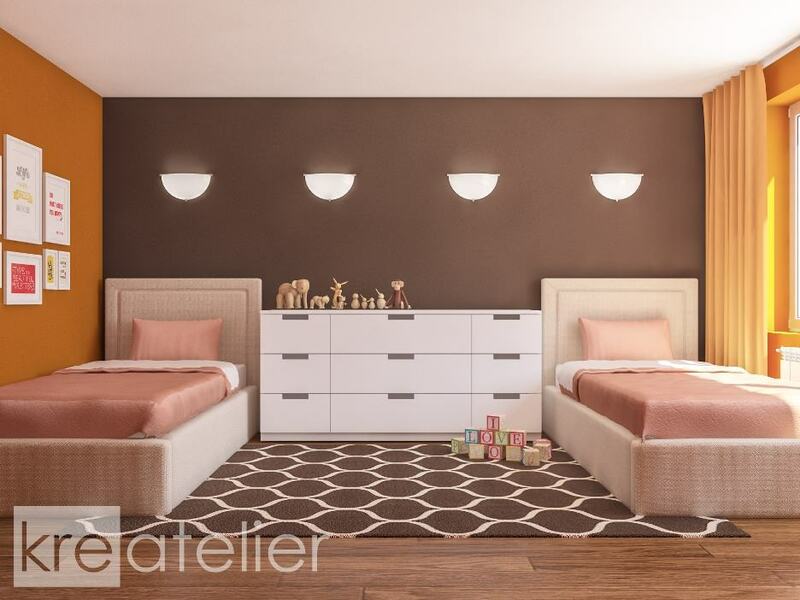 The kids’ bedroom is furnished with a pair of upholstered beds with storage. A large drawer chest is also available. 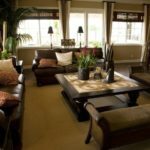 A large brown rug is laid on the floor and matched with a dark-colored feature wall. 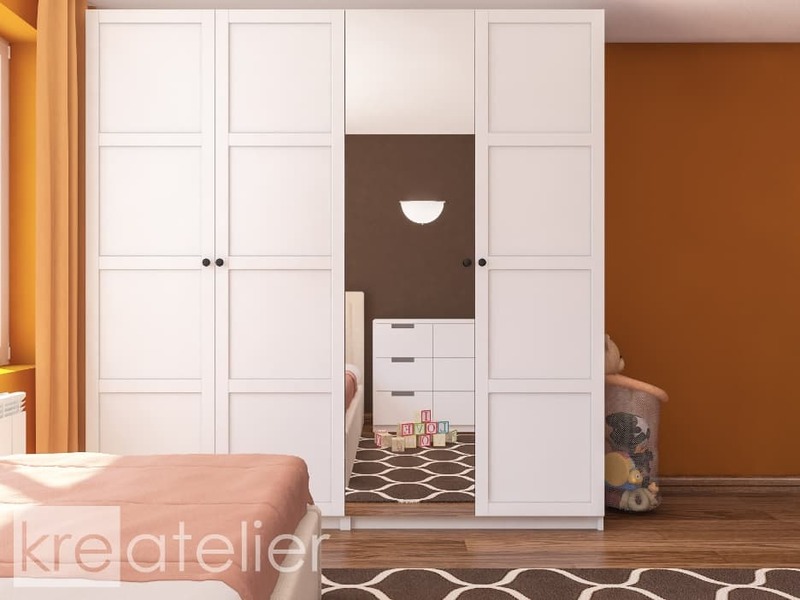 The kids’ room is also equipped with a large wardrobe in white. It is placed in the corner of the room and is large enough to fit all clothes that the kids may need. 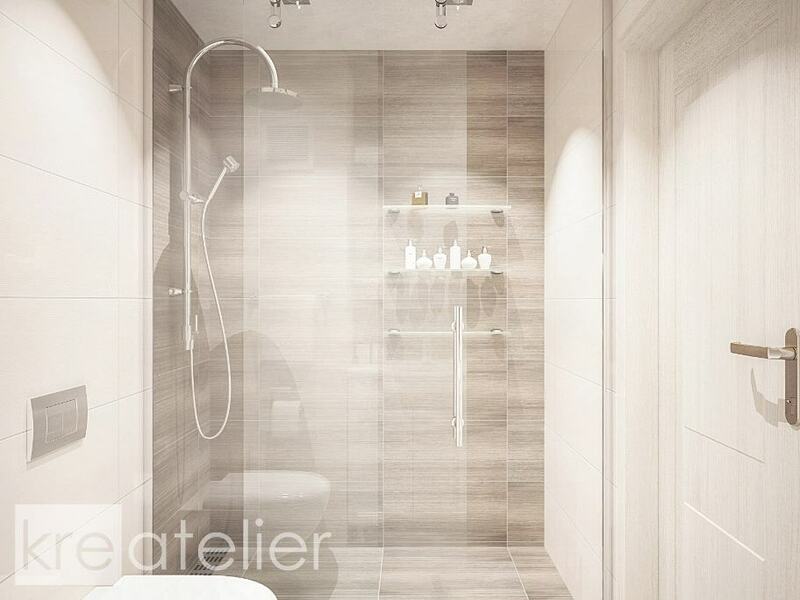 Have a look at KREATELIER WEBSITE and browse their projects and services for more great interior design proposals.